By 2020 there’ll be half a billion internet users in Africa, presenting an opportunity for African businesses and digital entrepreneurs. Youth unemployment across Africa is high (35per cent in South Africa, 17per cent in Kenya, 15per cent in Nigeria), developing digital entrepreneurship and creating new job opportunities for young people is critical to Africa’s transformative growth. Digital skills are still under-developed, making it harder for African economies to get the most out of the web and that is why Google wants to help close this knowledge gap. Our Target is to train and empower 100,000 people Nationwide within 5months. Kinetic Associates is the leading SME development firm and BUSINESS INCUBATOR in Nigeria. They nurture business ideas into thriving enterprises. 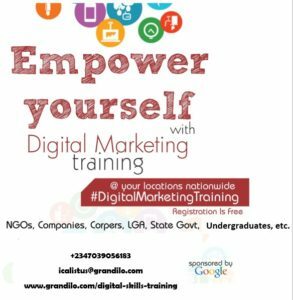 They also organize a one-day FREE training for a minimum of 500 interested individuals – Under-graduates/students, Corp Members, Un-employed graduates, Working Class Professional, Business owners, Women group, NGO’s, Digital Marketing Professionals, Startup entrepreneurs and Social Media Enthusiasts could take part in this training. Become an employer of labour – by setting up your own digital agency, offering digital marketing services to other businesses. Become the toast of employers. With your new digital skills you become employable, as a job seeker. Make progress towards earning your prestigious Certificate by Google. Everyone can succeed online, start a new business, grow their existing one, or share their Passion with others and earn. With over 80million Nigerians having access to the internet and a large number also very active on Social media platforms daily, the game has now moved ONLINE. To learn more about this Training, see this post.